These early, foundational Dzogchen texts--clear, lyrical, and rich in metaphor--were smuggled into Tibet in the eighth century on white silk, written in goat-milk ink that would become visible only when exposed to heat. These five texts are the root of Dzogchen practice, the main practice of the Nyingma school of Tibetan Buddhism. Vairotsana, a master among the first generation of Tibetan Buddhists, reveals here a truth that is at once simple and deeply profound: that all existence--life itself, everyone one of us--is originally perfect, just as is. 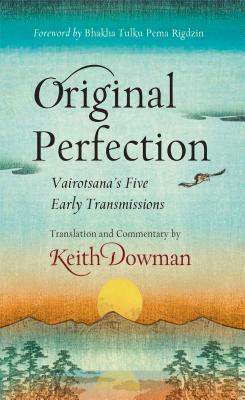 Keith Dowman's sparkling translation and commentary provide insight and historical background, walking the reader through the truths encountered in this remarkable book. Keith Dowman has been involved in the arena of Buddhism for more than forty years, living and raising a family in India and Nepal and in Tibetan refugee society. He received lay ordination in the Nyingma school of Tibetan Buddhism and is the author of more than a dozen books on Tibet and Tibetan Buddhism, including Flight of the Garuda, Sky Dancer, and Original Perfection. The Venerable Bhakha Tulku Rinpoche is a holder of the Tibetan lineage of Rigdzin Pema Lingpa and the founder of the Vairotsana Foundation.